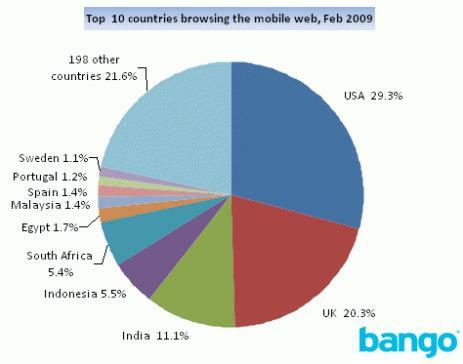 Mobile analytics provdier Bango reports that the US has overtaken the UK as the top mobile browsing and buying country in the world. It's not hard to imagine that the growing number of mobile subscribers, mobile Web capable devices and mobile-optimized websites have much to do with the surge. This is good news for both online retailers with mobile capabilities, but also for app developers and publishers who charge for subscriptions and exclusive content. This also points to the need to have a mobile-ready version of your website. Advanced devices like the iPhone and G1 do offer a way for users to view your regular site on a mobile, but there is still a need for custom mobile pages. Not only do advanced mobile devices have limited screen space, but some cannot properly render certain elements of many webistes, like Flash. And there are plenty of users who do not have an iPhone or G1, but can still get on the mobile Web and might want to access your site or products.